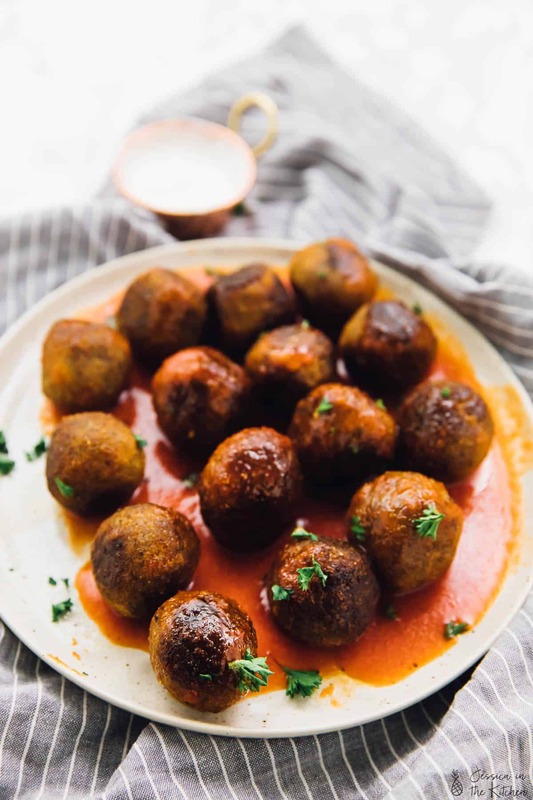 These Buffalo Quinoa Cauliflower Vegan Meatballs will be a HIT at your next party! They are incredibly easy to make, coated in buffalo sauce and so meal preppable! 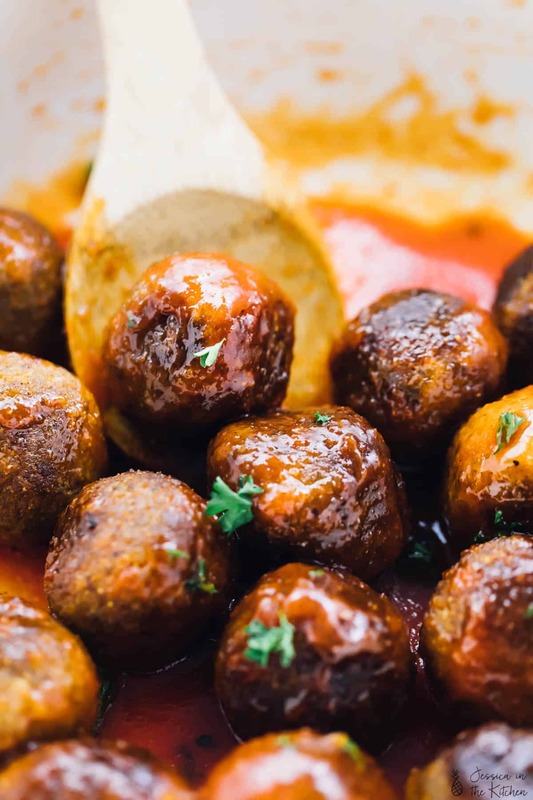 Imagine this: your new favourite vegan meatballs recipe, with the best texture, slathered in a sweet and spicy buffalo sauce. That’s exactly what you’re going to get with this recipe. 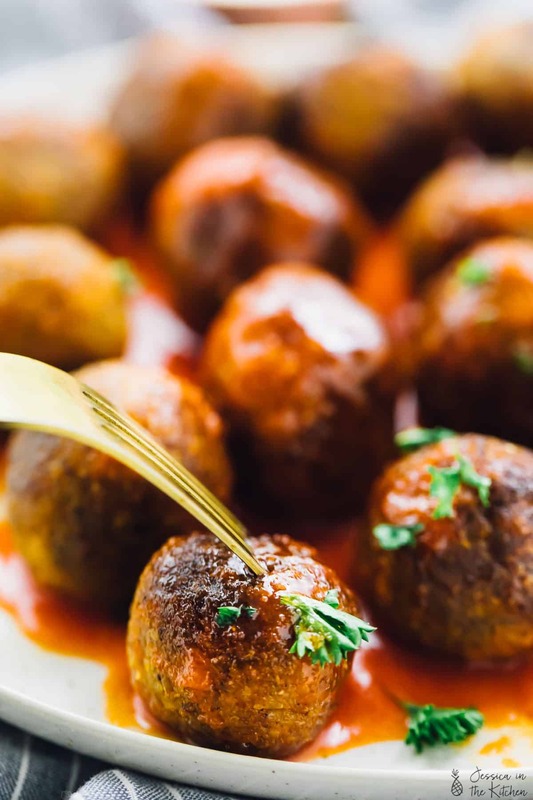 Now I’ve made meatballs before when I made my beet meatballs, and after that I knew I wanted to delve deeper into the meatless meatballs world. That’s one of the things I love about vegetarian and vegan food. You can use such a range of ingredients to recreate dishes that you can make something that is completely in your taste. There are no rules and don’t ever let anyone try and tell you that there are! So here’s the assembly of these vegan meatballs. I knew using cauliflower and quinoa together to make these vegan meatballs would make the perfect texture combination after making these Quinoa Cauliflower Burgers. The roasted cauliflower alone is magnificent just like in my sticky sesame cauliflower wings which mimic chicken, and quinoa adds a lovely texture while also adding lots of fibre and added protein. After that it was really about binding and seasonings. Regular meatballs have eggs and breadcrumbs as a binder. I replaced the eggs with my fave egg replacer from Bob’s Red Mill. You could also use flax eggs, but I would remove a tablespoon of water per flax egg to make them better binders. I definitely used the breadcrumbs because I wanted to give these vegan meatballs the best texture and I just feel like they’re the best binders for that. P.S. I usually don’t buy breadcrumbs!! We get a multigrain bread from our favourite bakery and then when it becomes a few days stale, I freeze it. Then when I’m ready I toast it to thaw and crumble it into breadcrumbs in my food processor or my blender. So if you’re gluten free, you can buy a local gluten free bread and do the same!! It’s SO easy and since it’s always in your freezer, you’ll have always fresh breadcrumbs on hand. For seasonings we have garlic and onions, my favourites. So these aren’t overloaded work and are still packed with tons of flavour. After creating the vegan meatballs, you cook them off until they get nice and browned and look absolutely beautiful. Then time for that buffalo sauce. Okay, I love spice, but even this is spicy for me. If you’re not into spice you can use a different sauce like the one from my sticky sesame cauliflower wings. If you love spice like the Mr. who CHOMPED these down, proceed my friend. I literally had to ask him to slow down on *my* meatballs – oh how possessive food can make us right?! It’s hard when it’s so good! You can enjoy these vegan meatballs alone, in a nice hoagie or with cauliflower rice or quinoa on the side, you know, for a double down. You could even have them on toothpicks as an appetiser at your Super Bowl party! All of your guests will absolutely love them and you can make them in advance. They lasted three days in our fridge, mainly because we finished them by that time! Feel free to double or even triple the recipe if you need more since each serving makes 16 meatballs. I also made a Vegan Ranch Dressing that you can serve alongside these vegan meatballs! The countdown to Super Bowl is here! Enjoy friends and be sure to whip these up for your own party or gathering! Mix all the ingredients together other medium low heat in a sauce pan until completely incorporated. Set aside until ready to use. Preheat oven to 450°F/230°C. Cut the cauliflower's stem off, and cut into even-sized florets. Drizzle the cauliflower with maybe a teaspoon of oil. Roast the cauliflower for 15-20 minutes in the oven. Remove and allow to cool for a few minutes. Add the 1 cup of riced cauliflower and all the other meatball ingredients EXCEPT the coconut oil. You can pulse them or mix them together until they form into a tight ball, combining everything. Heat the coconut oil in a pan over medium high heat. While it's heating, use a tablespoon measurer to form one raw meatball and shape into a ball with your fingers. You can place them on a plate while the oil heats. Add one meatball to test the oil. Cook on one side for about 1-2 minutes, turning on all sides onto fully cooked inside and out, about 4 minutes. You can add as many meatballs as can fit in the pan without overcrowding it, cooking them all for about 4-5 minutes turning on each side, to cook them through. Lower/turn the heat off. When the heat has cooled down, add in the sauce. You want to do this because if the pan is too hot, the sauce will spew and the heat can be dangerous while so hot. Coat the meatballs in the sauce and then remove the pan from the stove. Serve the meatballs and enjoy!! You can enjoy these vegan meatballs alone, in a nice hoagie or with cauliflower rice or quinoa on the side, you know, for a double down. You could even have them on toothpicks as an appetiser at your Super Bowl party! I strongly recommend using the Bob’s Red Mill Egg Replacer! It acts just like regular eggs and is really great for binding these vegan meatballs. 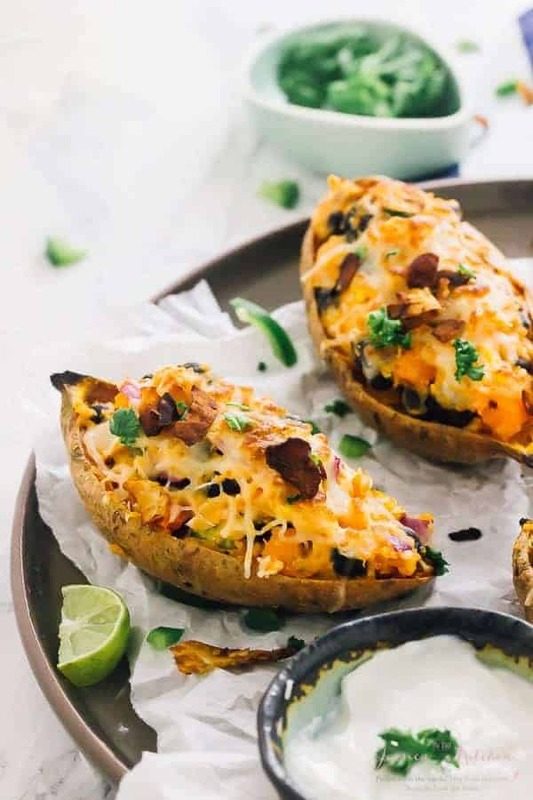 You can serve these with my vegan ranch dressing! I am absolutely drooling over this recipe and these photos! These sound and look absolutely delicious! Hi! I wonder if you can bake the meatballs instead of cooking them in oil on the stove top? I haven’t tried it but you should be able to! The texture wouldn’t be the same though. I haven’t tested it so I can’t give you a specific time, but I would bake them at 450 until cooked, maybe 15-20 minutes? I can’t give a guarantee to that but that’s what I’m thinking. Let me know if you try that please! 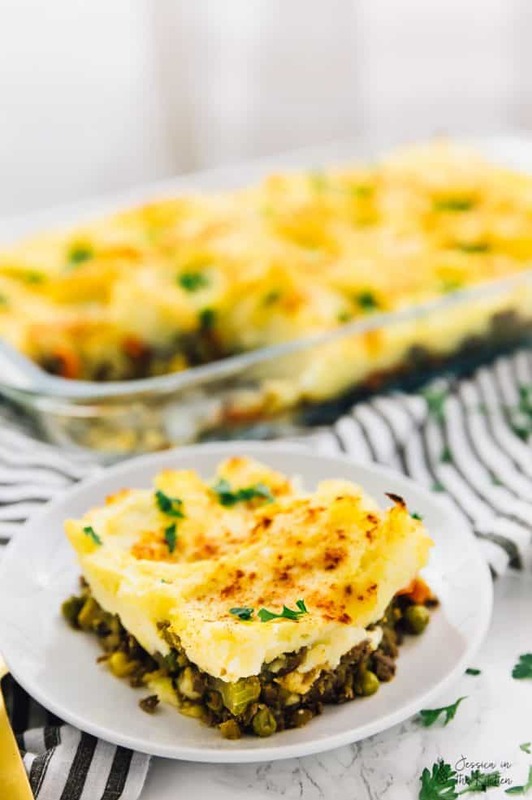 Is it possible to freeze a batch of these for quick dinner during weeknights? I haven’t tried that but yes that should be possible! I would cook them without the sauce, then freeze them, then reheat them in the pan and then put them in the sauce. I hope that helps!! 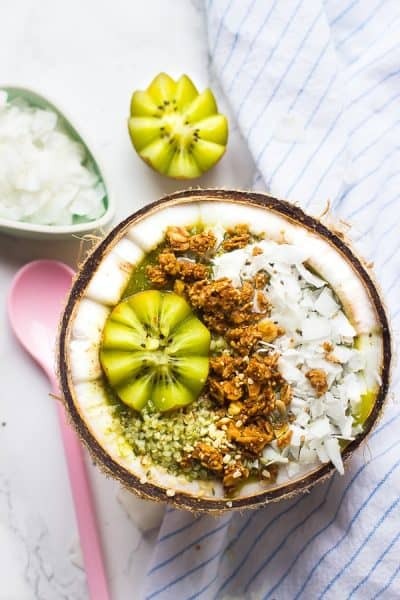 You have 1 1/2 tablespoons of coconut oil and then again 1 tablespoon. Do not know if I missed something but when do you use it and how much. Hi Estelle it should only be 1 1/2 tablespoons of coconut oil, I removed it to avoid confusion. I hope you enjoy the recipe!!! Hello Jessica , Which franks hot sauce should we use? Hi Jay we use the original cayenne pepper hot sauce hope this helps! Could you use these meatballs for a spaghetti and meatballs dish? Definitely!!! The meatballs take on any flavour of the sauce! I just made these tonight, they are super yummy, but the inside is quite mushy. Is that normal? IS there someway to make them so the inside isn’t so squishy? I’m glad you liked the taste! Let me see if I can help – what egg replacer did you use? Also, did you change/modify any of the ingredients? It definitely should *not* be mushy on the inside at all! The only liquid that could be in there is from the cauliflower – did you roast it per directions? Thanks Bonnie! Answering these will help me help you for sure! Hi. I like the sound of these. I’m not vegan. Can I use chicken eggs? One or two? I haven’t tested them with them, but I think they would work! I love your recipes and your style.Keep it up! Thanks so much Joyce! We will! oh…these are to die for. We’re glad you love the recipe Kate! Thank yo for your kind words!